Good question! Probably the second ranking query to the closely-related "How much snow is on the ground?" (answer: bare ground on the plains, several feet in the backyard). We are fortunate here on the east side of the Continental Divide, commonly known as the "Rocky Mountain Front" or simply "The Front", to have plenty of blue skies and sunshine outside our doors. Many of our friends in other spots around the state (particularly west of the divide) are sentenced to the endless cloudy days of the "gray valley." The price we pay for the gift of bountiful solar radiation is the rather pronounced and frequent occurrence of a stiff "Babb Breeze." That, and blizzards. And somewhat extreme temperatures. But hey, sunshine! The usual winter pattern here overlooking the St. Mary Valley goes something like this: We start with a beautiful, blue-bird, pretty-as-a-postcard winter morning, with the sun as high in the sky as it can muster on a short February day. Despite the amazing display of golden brilliance, the temps are very cold, somewhere between -20 and 10 degrees. The next day, temps start to rise....and we hold our breath. 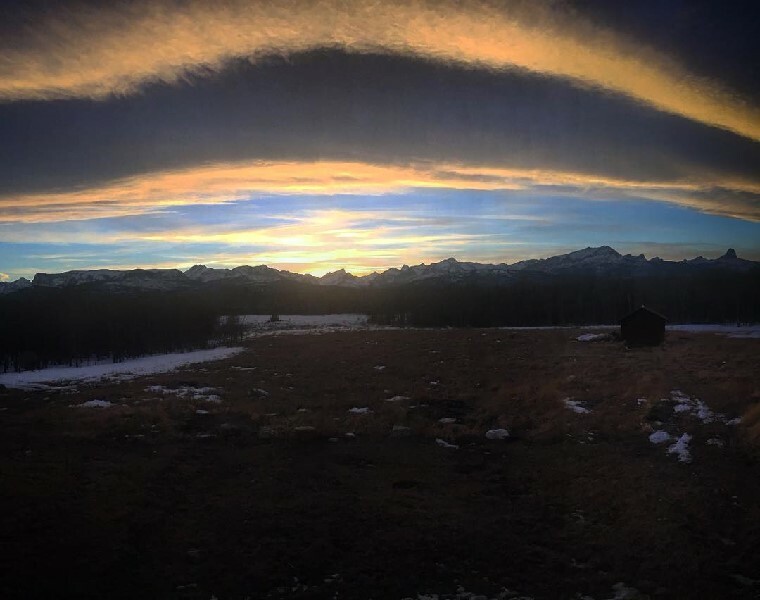 As the temps climb up towards freezing, a "chinook arch" forms over the Front. 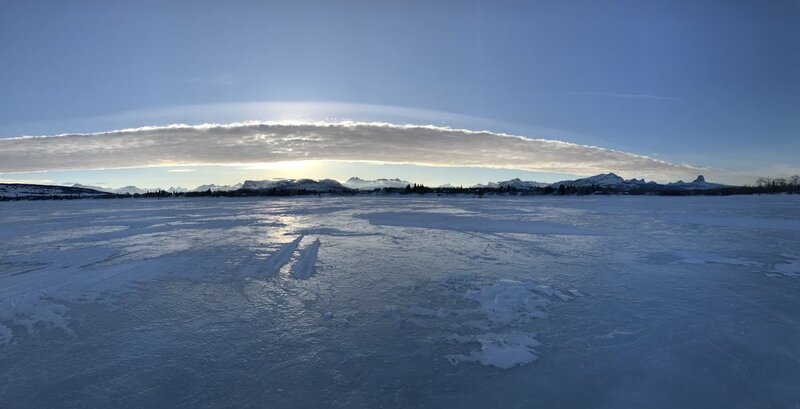 A Chinook Arch as seen from Duck Lake. The Cabin Co is situated just west of the shore. A Chinook (named for the people of the pacific northwest, with the wind itself colloquially known as an "ice-eater") is a pretty fascinating (and common, if you live where we do) weather phenomenon that has the end result of creating a very warm, extremely powerful wind. Basically, moisture-rich air flows from the Pacific eastward to the Rocky Mountains, where it is forced to rise due to the orographic effect. Upon rising, the air gets a lot colder and has to drop its load of moisture. This creates the wet, abundant snowfall evident on the west side of the divide in the Flathead Valley. The now dry air comes rushing down the slopes of the Rocky Mountain Front in the form of occasionally hurricane-strength winds. A healthy Chinook can dramatically raise temperatures in just a few hours- Loma, Montana had a recorded temperature change of -54f to +45f in less than 24 hours in 1972. Sunsets can create the marvelous appearance of a "Double Arch"
The wind usually warms things up a bit, but not often 100 degrees! When you are starting at -20 degrees, a breeze of 40-75 mph can create unbelievable wind chills in the -50 range. We usually get at least one wind event per winter in the 100-120mph range. The breeze generally lasts 12-36 hours followed by several days of relatively mild weather, with sun and clouds and a little snow and all the typical winter stuff. At that point, we will gear up for a snow event ranging from 3 inches to 5 feet...followed by a beautiful, blue-bird, pretty-as-a-postcard and well-below-zero day, at which point we start our cycle over. The snow/wind event always seems to come during the weekend, or whenever we are trying to get to town. That's the usual cycle, and during a "normal" winter we will get an occasional prolonged warming period, where some of the snow will melt and we can "reset". The reset is extremely helpful for keeping the roads plowed and maintained. The trick here is that the high winds create massive snow drifts, even when it isn't snowing. An inch of snow in the mountains can turn into 5 feet of hardpacked drift in your driveway pretty fast when you live on the Front. It can create some problems. The plowing is endless. When a vehicle gets stuck in the middle of the road, the best you can do is plow around it....or push it into the ditch. In a major blizzard event like the current one, plows simply can't keep up with the wind, especially with vehicles littering the road. We are up at the very top, where 464 takes that hard left turn. Plowing through a hard-packed drift is a like plowing through dry mud. It takes some work. This looks to be one of the most brutal winters in recent memory for our neck of the woods. The Blackfeet Reservation has experienced winter storms and back to back to back blizzards pretty much constantly since Christmas, with no warmup or reset, and no relief in sight. Just about every road near us has been closed more often than not, and every possible service from food deliveries to garbage collection is currently severely impacted. Grocery stores are switching from semis to train cars in hopes of stocking the shelves. Most of our friends and neighbors up here near Babb are used to this sort of situation- we have a hard time making it to town even when the roads aren't closed! But while we are prepared for most anything, this winter is approaching an extreme that is beyond the reach of the usual resources. People are in need of food, warmth, and medical supplies. 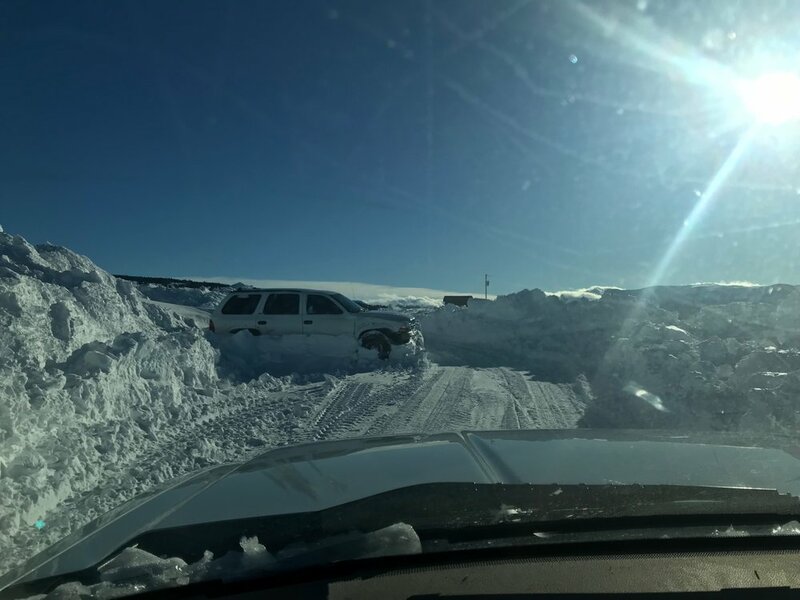 The communities of Browning and Heart Butte have been slammed repeatedly by winter storms that would be devastating even if they approached one at a time. Six FEET of snow has fallen in February alone, and the drifts on the highways are 10 feet deep. Folks in town are tunneling to their doors and the snow is literally up to the roof. Conditions are about as bad as they can get right now, but everyone is helping their neighbors and doing their best. If you are interesting in assisting with relief efforts in the area, please check out the Blackfeet United Methodist Church, as well as Essential Eats Distributors. If after reading all that you still want to experience winter on the Front, we do have at least one cabin that is available in every season. It really can be remarkably pleasant and indescribably gorgeous over here. Just give me a heads-up, as I'll have some plowing to do to get you in!